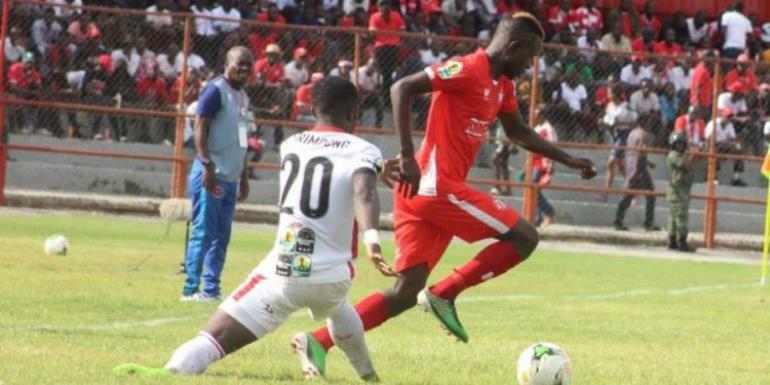 Nkana FC defender, Ben Adama has cautioned Asante Kotoko, insisting his outfit are not in Ghana to talk as Kotoko did prior to the first leg in Zambia. The Porcupine Warriors will host the Zambian side at the Baba Yara Sports Stadium on Sunday in the reverse leg of the CAF Confederations Cup after losing 3:1 in Kitwe. According to him, Nkana will do their talking only on the pitch but not on radio. “We are not here to brag as Asante Kotoko did on the radio when they arrived in Zambia," he told Kumasi based Sikka FM. “We will do our talking on the pitch of the Baba Yara Stadium on Sunday. “We are very poised and determined for the game on Sunday,” he added. The Zambian club arrived in Ghana on Wednesday and headed straight to Kumasi. They are currently pitching camp at Golden Tulip Hotel.